The 1ShoppingCart notification system sends messages via https of new events <sup>1</sup> that have taken place on your 1ShoppingCart merchant account. A message is created in XML and sent to a user configurable URL. The notification data can then be used to call the API and retrieve specific information, such as the details of a new order. The 1ShoppingCart notification system sends messages via https of new events 1 that have taken place on your 1ShoppingCart merchant account. A message is created in XML and sent to a user configurable URL. The notification data can then be used to call the API and retrieve specific information, such as the details of a new order. 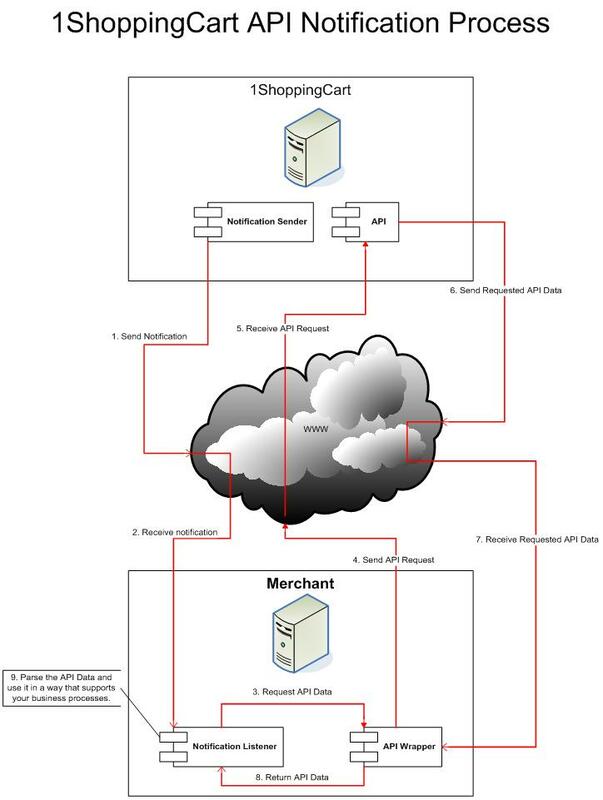 The following diagram shows the typical flow of data when the 1ShoppingCart API sends a new event notification.